Doll's Musings: 200 Follower Giveaway!! Finally! Right?!!!! I wanted to do this earlier but the weekend got crazy busy and last night I had a little time to stitch one part of the scissor fob I'm making for the giveaway! 4. Some extra little goodies from me!! I don't have a full picture of everything yet because I've been hunting for some extras and haven't found them all yet. When I do get everything together, I will add the photo to the side bar. The Giveaway Parameters. I will close the Giveaway on June 22nd and draw on June 23rd using the Random Number Generator, since I don't feel like typing and cutting names!! 3. Tell me about your very first cross stitch finish you made and/or your very first blog post where you introduced yourself to the world!! Don't forget to add your link if you chose the first blog post option!! I would love to read it!! That's it! My very first cross stitch finish was my mom-in-law's Christmas present which was a little pinkeep. She loves it even though there were flaws. We all start somewhere! I hope you enjoy this giveaway. I truly appreciate all your lovely comments and support! It means a lot to me! Titus also says hello and wishes you all good luck!! 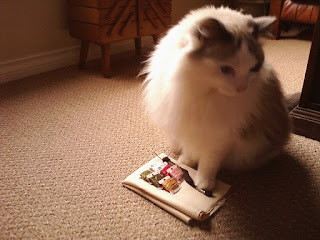 Yes, he has his paw on the linen and threads I put together for the bee scissor fob. See how he loves to help!! Congrats on the blog success! I'd love to be entered. Oh, my first cross stitch was making the eyes and mouth on a snowman. Congratulations on 200 followers. Please enter me - such a lovely giveaway. My first cross stitch was so long ago that I cannot remember what it was. But here is a link to my very first post nearly a year ago: http://kittenstitching.blogspot.com.au/2011/06/first-post-on-blog.html But not one person commented - I amazed that I had the fortitude to keep going with it! Of course, it includes a photo of my two little furbabies! I will put your giveaway in my sidebar, also. Would love to enter your give away. my first stitching was a little mat for my moms table I was 5 yrs old and it was on something like 10/11 count. My first one after was about 20yrs ago it was a Welsh Dresser. I stared my blog almost a year ago. Oh, Anne, that pic of Titus is FABULOUS!!!!! I love it. And grats on two hundred followers. I'm going to be doing my giveaway for the same number next month. Can't afford to do two in one month, lol. My first cross stitch was a Beatrix Potter sampler, though I never finished it. My first finish was, I think, a little mouse which came with a magazine, I gave it to one of my boyfriend's brothers as a birthday card. Good Morning Anne & Titus! Please enter me in your celebratory give away. Hello Anne, my name is Olga and I would like to enter in your celebratory give away. My first cross stich project was a beautiful yellow house with a fountain and gardens surroinding it. I am afraid is in Spanish but there is the google translator in it. I would love to enter your giveaway. 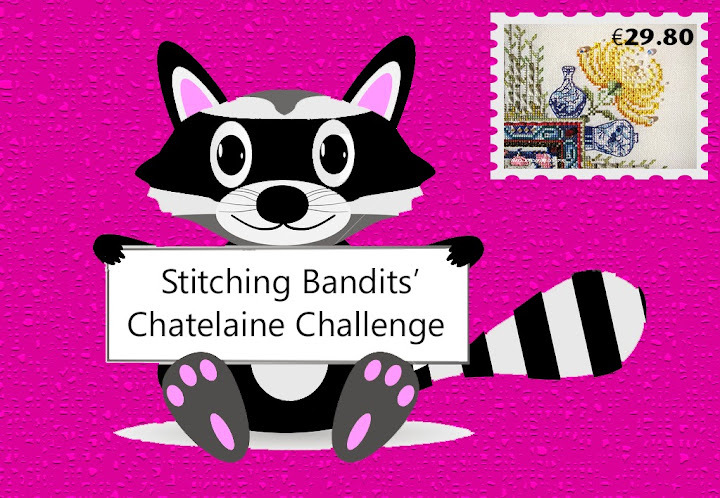 I am a follower and enjoy seeing what is happening in your stitching corner. Is Titus included in the giveaway?? He's beautiful. Congratulations on 200 followers! I'd love to be entered in your giveaway! My very first cross stitch was...gosh..AGES ago! I was in high school and my friend's mother always sat stitching in their living room...one day she offered to teach me, and I went out and bought my first kit. It was a sampler of each state and across the top was America. Sadly, I never finished it (got started on it, then started new ones and new ones).....that was 24 years ago! Congratulations on 200 followers!! I'd love to be in the drawing. My first cross stitch was called "Pumpkin Stew" I chose this because a friend said the count was big enough to do in a car. Plus, I'm a major Halloween lover!!!!! What a great giveaway and a fun competition. I actually read every comment before leaving mine LOL. Congrats on the 200 followers too. Congrats on reaching 200+ followers! Sure would love to join your giveaway, thank you for the chance! I love flowers, the first piece I stitched was a small flower design from Cross Stitch Magazine " Quick n Easy". Titus, you are gorgeous as always! Anne, what a lovely giveaway - please add me to the list. Goodness me I have been racking my brain for a day or so trying to work out what my first stitching piece was way back in the 80's.. and I really can't remember - but I do know what I stitched in the first year of stitching as I still have it unframed!!! It was a Pierrot clown. I have another 2 or 3 in the set sitting in my stash!!! My blogging began less than a year ago so perhaps that doesn't count. So, I will go with my first piece! I can't remember how young I was when my mom bought my first attempt, a printed pattern of bunnies in a garden, I do believe. I think she wanted me to do something that would make me sit down and shut up, ahaha~ Well, it didn't work; I never sat down nor shut up long enough to finish it. I still have the piece, though, with all my horrendous child-stitches! The piece I taught myself when I finally learned to sit down and shut up was back in '09 (ages ago, right?) and was one of those tiny kits with a plastic hoop. I never took a picture of it, but it's hanging on my mom's fridge. Congrats on 200+ followers. I would love to be entered into your giveaway. My first cross stitch was the letter "L" that I made into a paperweight. My mum still has it on her bedroom window. My friend taught me how to cross stitch and helped me make the paperweight. 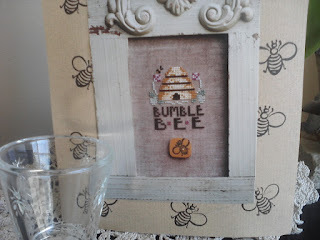 Anyway, please do enter me in your giveaway :) Here's my very first blog post which answered your question of my first cross stitch finish too. That was about fifteen years ago o.O Since then, I've split up with the guy mentioned in that post but I still gotta thank him for bringing me back to cross stitch. LOL, Anne, you've certainly developed your online personality, and your stash. Grats on the followers!! Congratulatons on your 200 followers!!! My first finished project was a stampped cross stitch of a siamese cat and a vase for my Mum. Congratulations on all of your followers! The first stitched piece that I actually finished into anything was for my grandmothers. I stitched them each a little floral motif and then "framed" them in a wooden hoop and edged them with lace. I was about 12-13 years old. 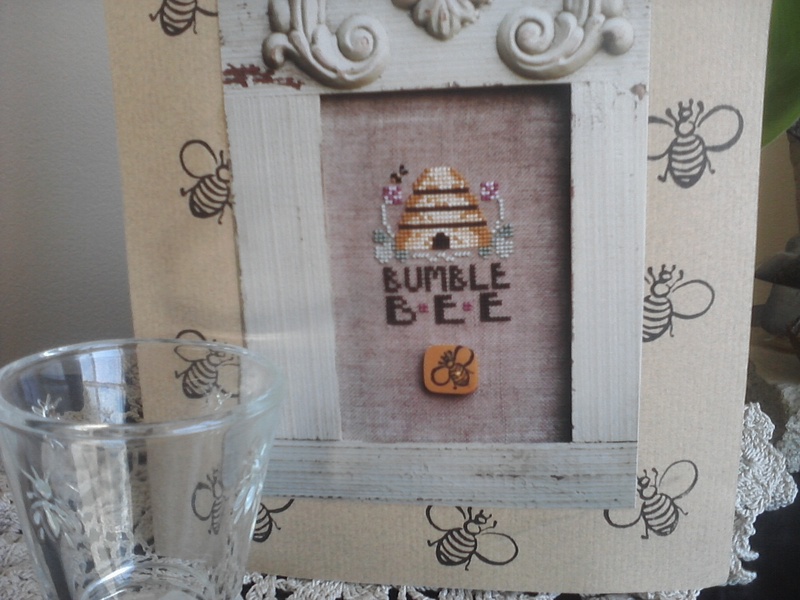 I love bees and would love to be entered. I am giving you a link to my first post...only started because my sister was driving me crazy about starting a blog!!! I'd love to be entered into your fab giveaway please! I first stitched at school, but didn't do it for years and years, until last year when I got my crafty flair back and I stitched myself an eeyore bookmark! It's very cute. which tells you how I started again! Please enter me into your draw - shame that Titus isn't included but then I doubt he would enjoy the trip across the Atlantic! Wow, I've been stitching for so long I can't even remember my first finish so I'll have to share my first blog post (http://gizzimomosstitchyplace.blogspot.co.uk/2010/09/hi-guys-this-is-my-first-blog-on-here.html) from 2010..... seems like such a very long time ago. Great giveaway and I'd love to be included! Congratulations on reaching over 200 followers. Please enter me in your Giveaway. I remember stitching on bina fabric, mostly different stitches, when I was about 5. Here is also the link to my first post. 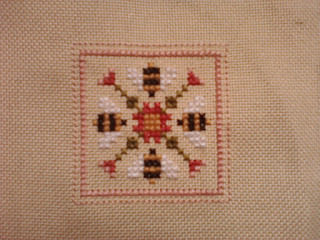 (http://maryjoanstitching.blogspot.co.uk/2011/01/welcome-to-my-first-ever-blog.html.) I have also posted your giveaway on the sidebar of my blog. Congratulations on reaching 200+ followers! I am a new follower (thanks for stopping by my blog). My first cross stitch project was in the 60's. It was printed on the fabric and said "Don't wait for your ship to come in, swim out after it" And there was a little boat on it. Congratulations on your 200 followers. I recognise the quilter who designed the dog fabric - Lynette Anderson- a fellow Aussie like myself. My first cross stitch was when I was 12. It was a proper grown-up counted cross stitch featuring a large basket of flowers. I still have it and love it. So happy to find your blog and become a follower today! And then there's a bonus of a giveaway! I've only dipped my baby toe into the blogosphere by contributing to the Cottage SAL blog hosted by Vonna, but I'm constantly lurking on my favorite stitch blogs looking for inspiration. 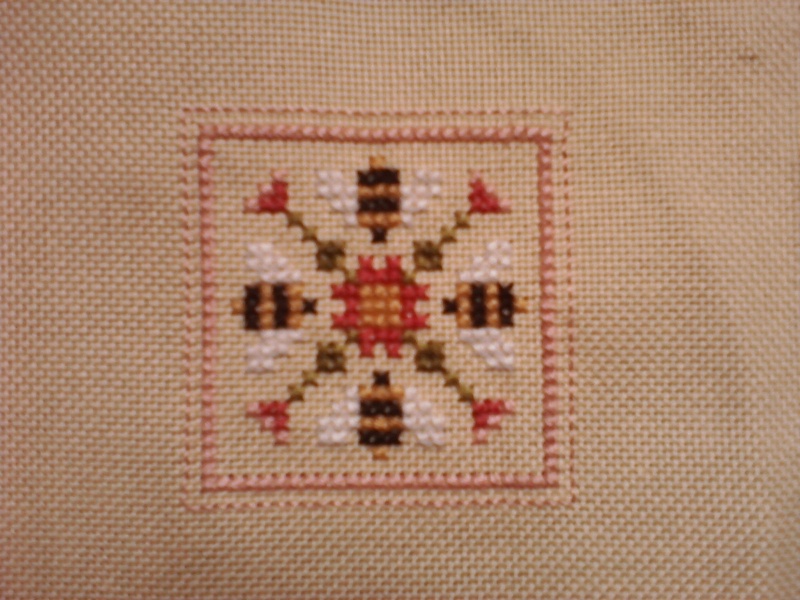 My first finish was a tiny Christmas Stocking kit that my friend's mother had in her stash when I was about 14. Small start to a big addiction! Congrats on reaching 200 followers! Thank you for visiting my blog and commenting on my first post. It was published yesterday and can be found at: http://1897schoolhouse.blogspot.ca/2012/06/i-have-saying-for-months-that-i-plan-to.html?showComment=1339967246067. It has taken me months to follow-through on my intention to blog and now I can't stop thinking about what I should write about next! congrats for the 200 followers! Congratulations on your huge flock of followers. You must be doing some right here. I would love to be entered in your giveaway. June 22 is my birthday, so I'll keep my fingers crossed! Not sure I remember my first cross stitch project, but one of the first was a basic street scene from OSU (Ohio State) for my brother. It had the script Ohio in it. It was fun! I did uncounted embroidery as a child, taught by my grandmother. I remember being amazed as an adult to see the scene recreated in counted cross stitch done by my sister on a blank piece of fabric...I had never heard of counted cross stitch! And, of course, the rest is history! I'm not sure how I missed this! I'd love a chance to win your cute fob. I think my first cross stitch finish was actually a Prairie Schooler design, one of the smaller Santas, and it was stitched on some sort of evenweave. It was my neighbor that got me started on stitching, but as a small child my grandmother taught me some simple embroidery stitches. I would love to be included in your giveaway please, I am already a follower. My first cross stitch was of a teddy bear holding a love heart, it was one of those small kit ones that came with a plastic frame, I was 15 years old. Do include me in a giveaway. My first cross-stitch was a Joan Elliot pattern for my second child's nursery. Congrats on such a successful blog! I would love to be entered in your giveaway. My first cross stitch was a brown tabby sitting on the floor in the sunbeams coming in from a window. I have no idea who designed it. Bees!!! I love them! =) The fob is too cute. Let's see, I *think* the first piece I ever stitched was a small owl that was a "learn to cross stitch piece". It was either that or a cat that went in a glass paperweight with "PTL" (Praise the Lord) over it. My first finish was a journal my neighbor helped me make, that I stitched my name and some roses on the front of. I was 12, and I still have the journal today 20 years later. Congrats on your blog reaching 200 followers! Well, that's what I get for being behind on blogs :( I miss all the giveaways - sigh - congrats on 200 followers, that's awesome! Cats are so helpful, aren't they? The other day Vincent decided to be SO HELPFUL that he pulled my knitting needle right out of my project. TUSAL and Last Day for Giveaway! IHSW Results and Giveaway Fob Finished! !